Sun Ra (born Herman Poole Blount, legal name Le Sony'r Ra; May 22, 1914 – May 30, 1993) was a prolific jazz composer, bandleader, piano and synthesizer player, poet and philosopher known for his "cosmic philosophy," musical compositions and performances. He was born in Birmingham, Alabama. He is a 1979 inductee of the Alabama Jazz Hall of Fame. "Of all the jazz musicians, Sun Ra was probably the most controversial," critic Scott Yanow said, because of Sun Ra's eclectic music and unorthodox lifestyle. Claiming that he was of the "Angel Race" and not from Earth, but from Saturn, Sun Ra developed a complex persona using "cosmic" philosophies and lyrical poetry that made him a pioneer of afrofuturism. He preached awareness and peace above all. He abandoned his birth name and took on the name and persona of Sun Ra (Ra being the Egyptian God of the Sun), and used several other names throughout his career, including Le Sonra and Sonny Lee. 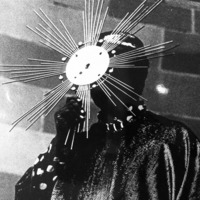 Sun Ra denied any connection with his birth name, saying "That's an imaginary person, never existed … Any name that I use other than Ra is a pseudonym." From the mid-1950s to his death, Sun Ra led "The Arkestra" (a deliberate re-spelling of "orchestra"), an ensemble with an ever-changing lineup and name. It was by turns called "The Solar Myth Arkestra", "His Cosmo Discipline Arkestra", the "Blue Universe Arkestra", "The Jet Set Omniverse Arkestra", as well as many other permutations. Sun Ra asserted that the ever-changing name of his ensemble reflected the ever-changing nature of his music. His mainstream success was limited, but Sun Ra was a prolific recording artist and frequent live performer. His music ranged from keyboard solos to big bands of over 30 musicians and touched on virtually the entire history of jazz, from ragtime to swing music, from bebop to free jazz. He was also a pioneer of electronic music and space music . He also used free improvisation and was one of the first musicians, regardless of genre, to make extensive use of electronic keyboards.